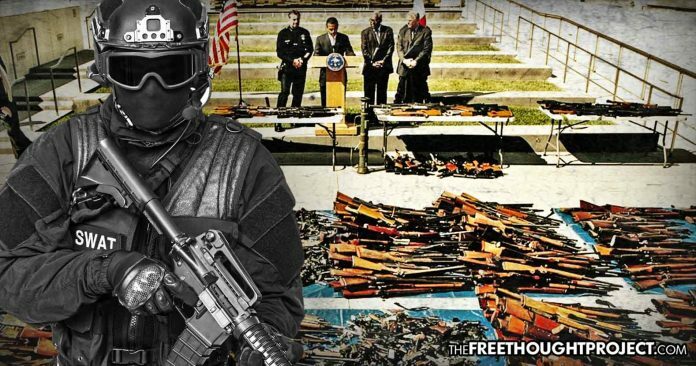 As politicians claim they aren't coming for your guns, over 1,700 citizens have had their guns confiscated in 2018 and this number is likely far higher as many states don't report it. As politicians and anti-gun rights activists continuously chant, we dont want to take your guns, behind the scenes  in only the year  politicians have been working overtime to limit your right to bear arms. These laws are all a reaction to the tragic shooting in Parkland, Florida and, like most politicians always do, they are not letting this tragedy go to waste. Since the tragic shooting in Florida last February, the Giffords Law Center to Prevent Gun Violence has recorded a whopping 55 new gun control measures in 26 statesin just the first six months of the year. Some of these laws being passed are Red Flag laws which are used to disarm individuals who are reported as a threat by a family member or friend. Many believe that these red flag laws are dangerous as they can prompt police action with little to no due process. As a recent report out of FOX32, points out, nine states have passed laws over the past year allowing police or household members to seek court orders requiring people deemed threatening to temporarily surrender their guns, bringing the total to 14. Several more are likely to follow in the months ahead. To show how willing these states are to use these laws, an unprecedented 1,700 orders to seize guns were issued in 2018, likely resulting in the confiscation of thousands of guns. Whats more is the fact that this number is likely far greater because there is no requirement to report these numbers and this data doesnt include California who has recently implemented some of the most draconian gun laws in the country. To those who may be in favor of such laws, consider the following: There is no way to stop an estranged spouse from calling police repeatedly and telling them their ex is threatening to cause harm to others. Anyone, any time, now has the ability to claim someone else is a threat and have police take their guns. One does not need to delve into the multiple what if scenarios to see what sort of ominous implications arise from such a practice. Luckily, some states have put in checks that require further investigation before police go in to take someones guns. Although it is not perfect, an example of one of these red flag laws with a system of checks is in Illinois. Gov. Bruce Rauner signed laws last year authorizing judges to take weapons away from people facing problems that make them dangerous to themselves or others. However, the person making the claim has 14 days to produce clear and convincing evidence that the person in question is potentially dangerous and should have weapons taken from him or her for up to six months. Although the ostensible intention of these recently passed laws is to stop a future tragedy, it is important to point out that there were already laws on the books that shouldve stopped Nikolas Cruz from ever getting a gun. But the none of them worked. Citing Cruz as the reason for advocating the erosion of the 2nd Amendment, the anti-gun activists are claiming he shouldve had his guns taken which would have prevented the tragedy. Sadly, however, they are ignoring the fact that he was accused of multiple feloniesand shouldve never been able to purchase a gun in the first placebut law enforcement failed to act on any of it. Also, in California as TFTP reported last month, taking someones guns away does not prevent that person from illegally obtaining another firearm and using it to commit murder. In January, a tragedy unfolded in California as a deranged gunman, Kevin Douglas Limbaugh, walked up on an innocent woman, officer Natalie Corona, pulled out his guns and began shooting her repeatedly until she died. Limbaugh then fired several more shots at others before turning the gun on himself and taking his own life. Limbaugh obtained the gun illegally because police had already taken his legal ones. According to police, Limbaughs guns were confiscated last year likely related to the red flag law. In September, Limbaugh was charged with a felony count of battery with serious bodily injury. That charge stemmed from Limbaugh punching a co-worker, Gilbert Duane McCreath, while the two worked at the casino the night of Sept. 20, according to the Sacramento Bee. After the charges, Limbaugh was given a high-risk assessment that determined the chance of him re-offending was low, but he was still ordered to turn in his registered weapons to police, the only one being a Bushmaster AR-15. On November 9, Limbaugh turned in the weapon. Sadly, the laws designed to keep the guns out of the hands of bad people failed, and an innocent young woman was murdered. The reactionary nature of disarming Americans because deranged psychopaths kill people is dangerous and only serves to keep the guns out of the hands of law abiding citizens as the above two cases illustrate. Moreover, deranged psychopaths dont even need guns to cause mass death. Just look at the tragic case in Canada in April. In Canada there is no legal right to possess guns. Canadian civilians arent allowed to possess automatic weapons, handguns with a barrel shorter than 10.5 cm or any modified handgun, rifle or shotgun. Most semi-automatic assault weapons are also banned. But that didnt stop Alek Minassian, 25, from killing 10 people and injuring 15 others. Minassians desire to take lives was so strong that he didnt need a gun to murder. He simply rented a Ryder van and went to it. According to a 2015 study, even if all guns were removed from America, in a ten year period, 355 people still wouldve been murdered in mass killings. From 2006 to 2015, 140 people were murdered by arsonists in mass fires, 104 were stabbed in mass stabbings, and 92 people were beaten to death in mass killings. To reiterate, these are deaths in which four or more people were killed. People sufficiently enraged to commit such crimes may also be motivated to find other ways, criminologist James Alan Fox of Northeastern University points out. Sadly, the politicians and the gun grabbing elite  who have guns surrounding them constantly to provide them with protection  couldnt care less about the facts as they continue to employ this reactionary method at the expense of your right to self defense. The next time someone says, they arent coming for your guns, show them this article which proves them wrong  at least 1,700 times over. Well, since I am NOT a criminal, I guess I do not have to worry about anyone coming to my home to TRY to confiscate my Daisy Red Ryder. Rebellion to tyrants is obedience to God. "No one ever rescues an old dog. They lay in a cage until they die. PLEASE save one. None of us wants to die cold and alone... --Dennis Olson "
AMERICA! Designed by geniuses. Now run by idiots. Stone, can you delete this? Somehow, got a double post. You're still eligible for Red Flag gun confiscations. There must be someone, somewhere who doesn't like you? Or some joker who'd like to see a SWAT team do a gun raid on your place? You don't have to be convicted of anything, or even accused of jaywalking. Some nosy neighbor, crazy relative, whatever, just calls up 911 and tells them that you look scary and have an "ARSENAL" of machine guns, etc. packed full of cop killer bullets, Any sort of nonsense will do.
" You're still eligible for Red Flag gun confiscations. There must be someone, somewhere who doesn't like you? Or some joker who'd like to see a SWAT team do a gun raid on your place? You don't have to be convicted of anything, or even accused of jaywalking. Some nosy neighbor, crazy relative, whatever, just calls up 911 and tells them that you look scary and have an "ARSENAL" of machine guns, etc. packed full of cop killer bullets, Any sort of nonsense will do. " Well, you make valid points. That is why if they come here, they will have to get past Gort. He does not like tyrant's !! Sadly, however, they are ignoring the fact that he was accused of multiple feloniesand shouldve never been able to purchase a gun in the first placebut law enforcement failed to act on any of it. He was never convicted of a felony, he passed a background check, and he purchased his weapon legally. Now, if we're going to prevent people from purchasing a weapon because they were simply accused of a felony, that's a bigger problem than some state's Red Flag law. These are state laws. It all depends on how the law is written. 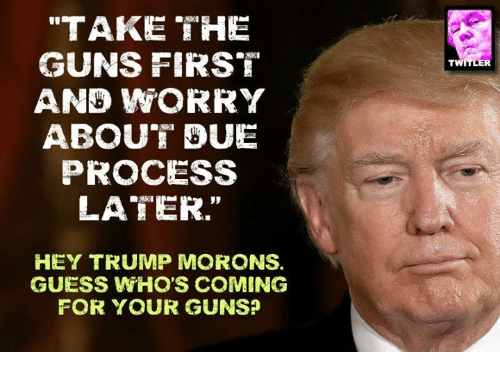 If an "informant" tells the feds that you have an "illegal Bump Stock" President Donnell could send an army of Federal SWAT groups, FBI, ATF etc to "Take the Guns First". All the trumpbots would cheer them on! It's a federal "regulation" that Donnell pulled out of his a$$. The trumpkins believe that Obongo was a slacker because he refused to ban bump stocks. All bets are off if you have an illegal anything.